Advances in International Accounting is a refereed, academic research annual, that is devoted to publishing articles about advancements in the development of accounting and its related disciplines from an international perspective. This serial examines how these developments affect the financial reporting and disclosure practices, taxation, management accounting practices, and auditing of multinational corporations, as well as their effect on the education of professional accountants worldwide. Advances in International Accounting welcomes traditional and alternative approaches, including theoretical research, empirical research, applied research, and cross-cultural studies. 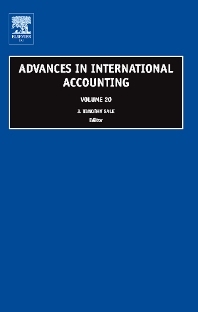 Advances in International Accounting is now available online at ScienceDirect — full-text online of volumes 14 onwards. University of Cincinnati, OH, U.S.A.